Erosion control log dams work on the same principal as straw bale check dams. They trap sediment on side slopes and in the upper ends of ephemeral drain-ages by reducing channel gradient. Erosion Control Logs are easy to place in contact with the soil and provide a low risk barrier to soil movement. GreenSolutions(TM) Erosion Control Logs, commonly called wattles, are a very effective sediment control measure. Available in a variety of sizes: 9", 12" and 18", additional diameters are available for more severe applications. 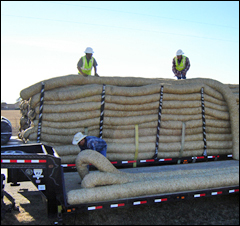 Erosion Control Logs are contained by a photodegradable netting which is designed to last at least two construction seasons. GreenSolutions(TM) Erosion Control Logs, when properly installed, reduce the rate of water flow, absorbing water and filtering sediment. A significant amount of sediment will drop out of the water behind the log during a rain event. Fiber is weed free and naturally biodegradable, enhancing the soil and helping vegetation become established. On steep slopes, logs used in conjunction with a properly designed and installed GreenSolutions(TM) erosion control blanket results in an effective BMP. Low cost, a single person can usually construct up to 6 a day. A low cost solution to sheet and rill erosion problems. Flexible enough to conform to most applications. Effective at trapping sediment and slowing the velocity of the water. Helps establish and store moisture for native vegetation. Straw wattles are sterile and seedless, eliminating the introduction of non-native vegetation. Straw wattle will decompose over time allowing regrowth of native vegetation that will help to stabilize the site. Plastic netting is photodegradable and straw becomes incorporated into soil. Functional Longevity (months): 12 mo. 12 mo. 12 mo. GreenSolutions(TM) Erosion Control Log 3 months after install.